Buy before 1st March and get 33% off. Normal price 15zl. 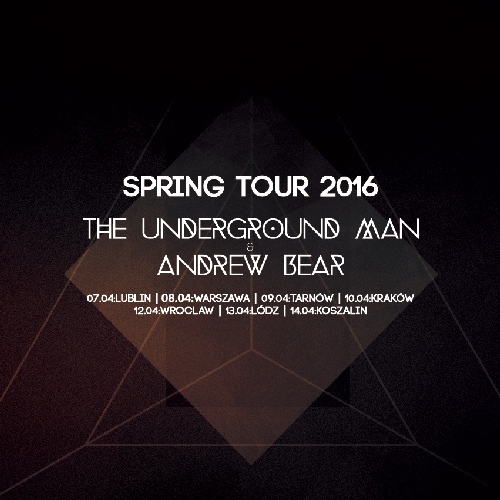 The Underground Man are proud to announce a spring 2016 tour with Ukrainian artist Andrew Bear. Blues Rock and Grunge artist Andrew Bear returns to Poland on his third European Tour to promote his second album ‘Lightness’ while The Underground Man return with some fresh material after a short winter break. It promises to be an evening of exquisite music and great fun. Andrew Bear is full-time, DIY, independent artist from Ukraine, currently based in Germany. Delivering solid grunge, blues rock and melodic pop with a high energy, Andrew Bear is one of the most touring bands from Ukraine. With regular touring and media airplay in Ukraine, Andrew Bear has built up a friendly fan base which has been developed over the years in all parts of the European continent. To get a taste of what's to come check out his latest single here.